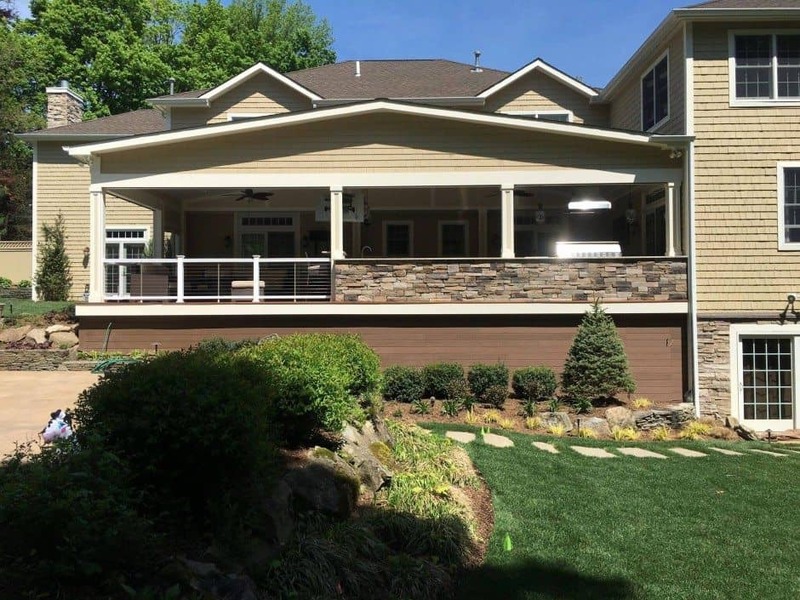 This covered outdoor entertaining area provides multiple uses under a single roof. 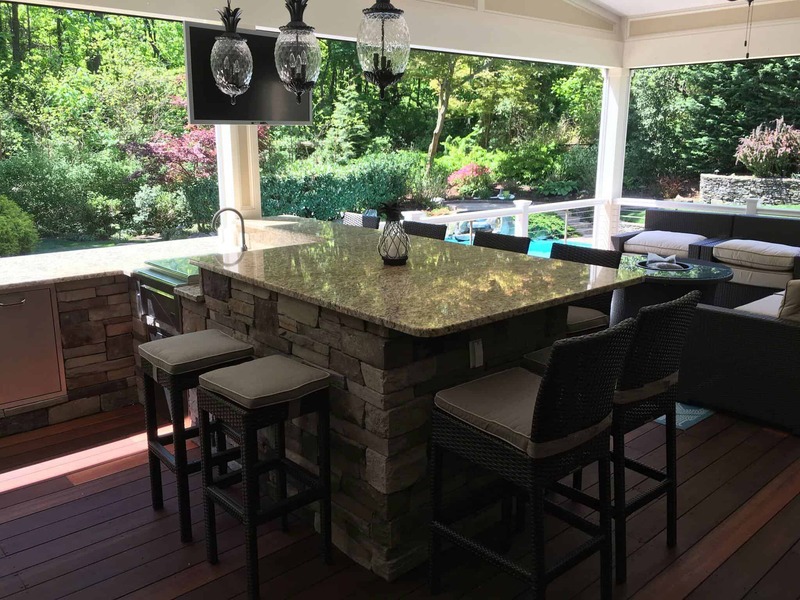 The client wanted an extensive outdoor kitchen, a wet bar with seating, a dining area for a table and chairs, a lounge area and a propane fire pit. Their main concern was to create a fully-usable space that would protect them from the elements. 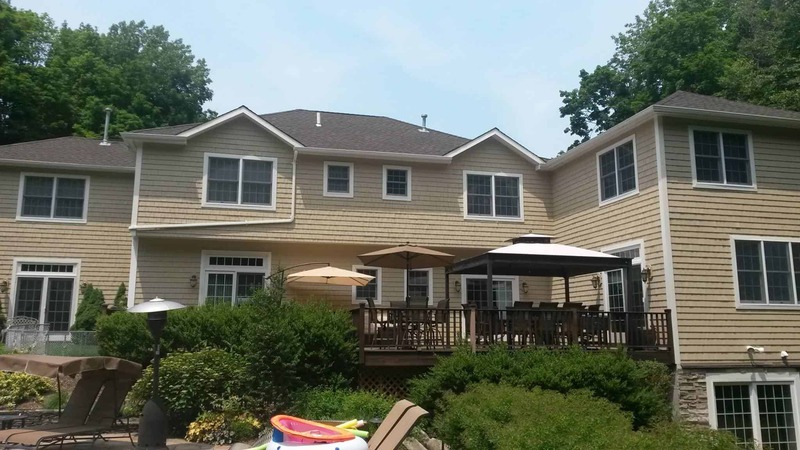 At first observation, the consensus was that a sled-style roof angling down off of the house would be the only option due to the low window heights above. After much analysis, the Green Island Design team proved that a frame roof with a cathedral ceiling would work structurally, as well as being the best option both aesthetically and functionally opening-up the entertaining space below. 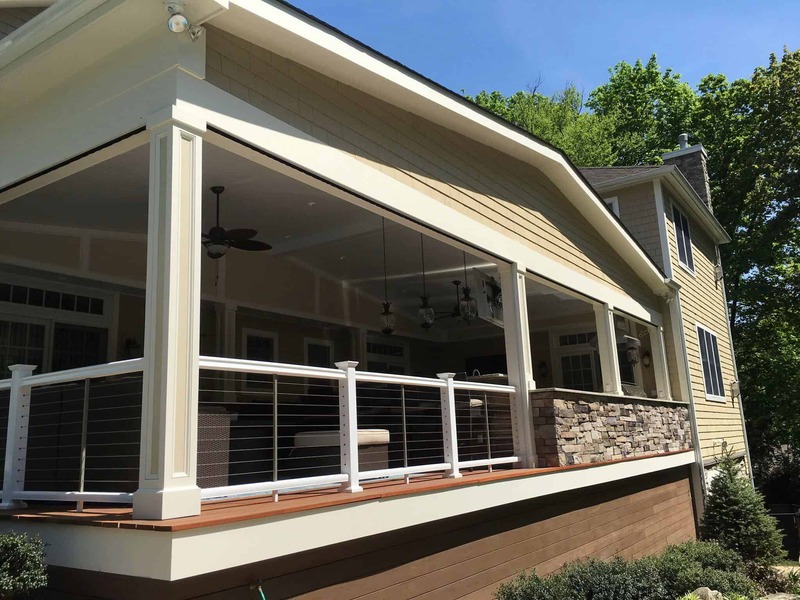 Notice how we incorporated the same Ipe deck flooring on the exterior below the framing as a functional insulator and full screen, which also ensured the overall design concept was continuous. Close-up view of the NanaWall and rust-resistant stainless steel cable and post railing system. 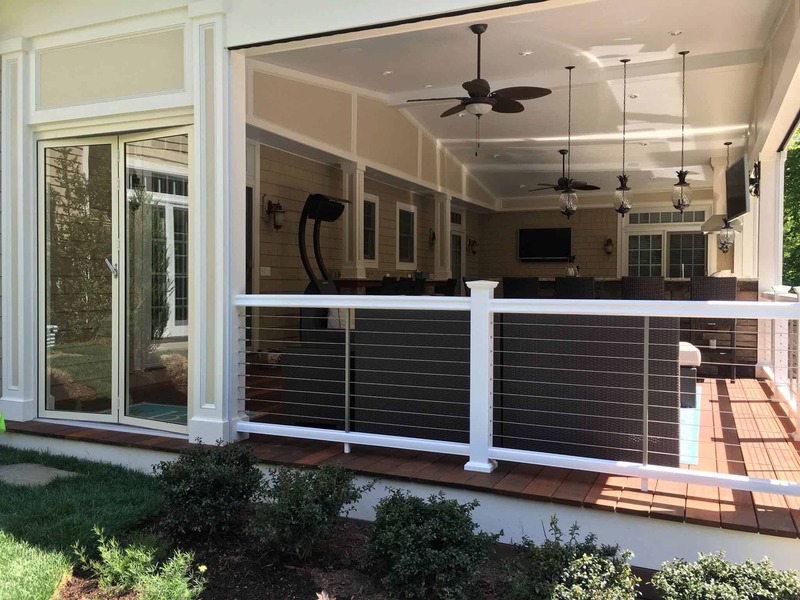 Head out to the pool through the accordion-style NanaWall door used for easy, in-and-out access while providing complete protection from pesky bugs. From a design perspective, dividing the areas spatially while also integrating the appropriate structural supports for the open air structure was a challenge. 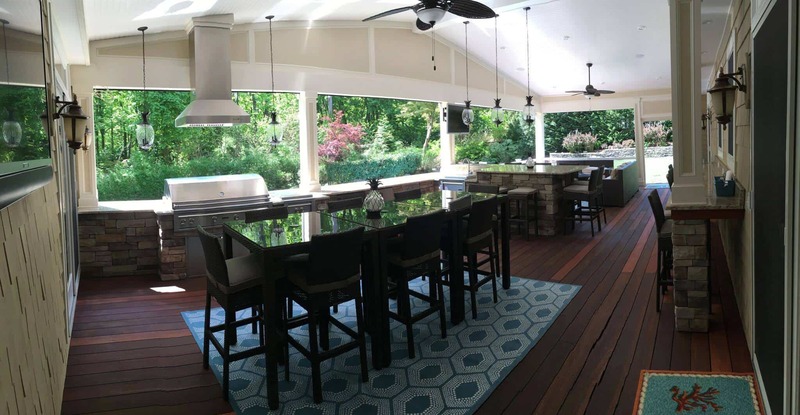 Green Island Design (in collaboration with Home Evolutions Corp), far surpassed the homeowners’ expectations by buffering the space from the elements using multiple custom remote controlled screens that retract out of sight into the overhead beams. Maintaining unobstructed views out to the existing pool area were very important to the client. 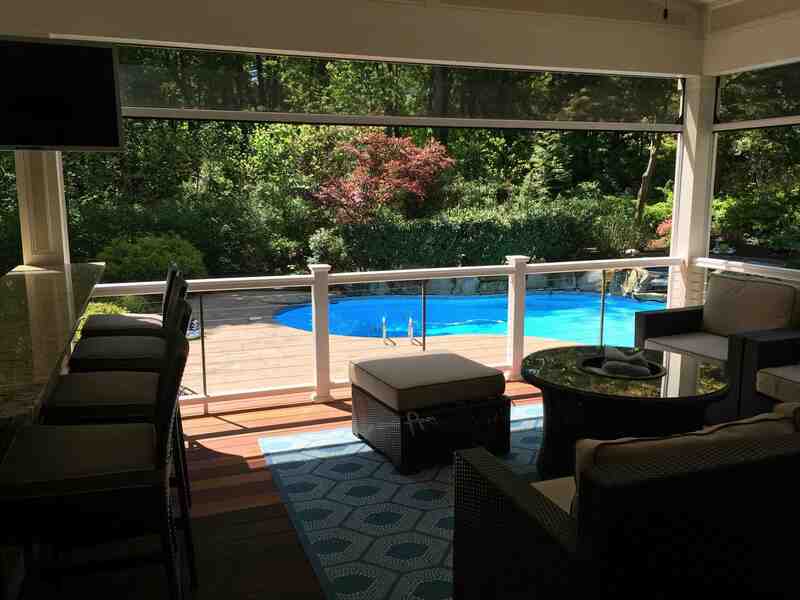 Therefore, we chose to use a rust-resistant stainless steel cable railing system that offered the needed protection along the edge of the space, as well as showcasing the panorama of the entire pool area. 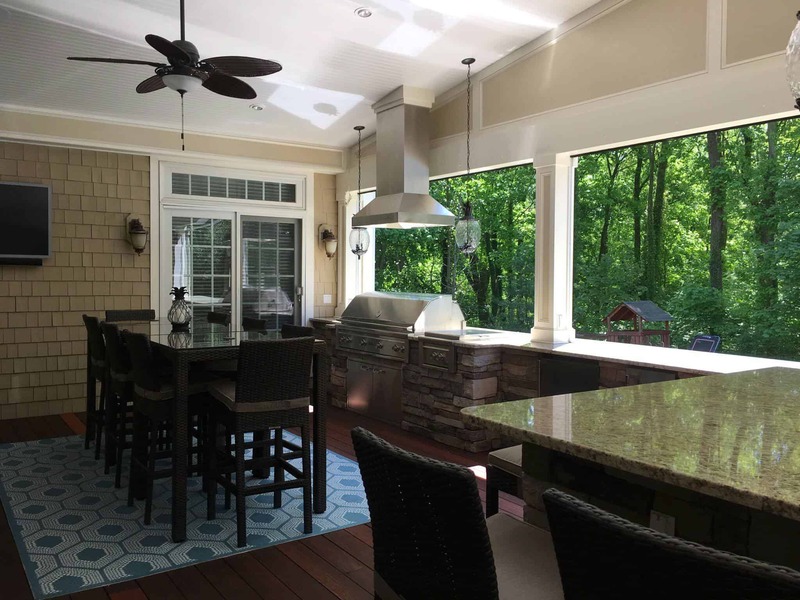 The outdoor kitchen continues along the perimeter and culminates with the raised bar area which offers a great transition between the lounge area and dining area. This view illustrates the high level of precision required along the column edges where the tracks for the screens had to be inset so as to appear virtually hidden. Wide view of the main dining area, Ipe flooring, ceiling treatments, lighting, décor, and modular lounge seating.